Today’s Feast of Saint Joseph, the Chaste Spouse of the Blessed Virgin Mary, is a time for Catholics to recall the just and quiet man of the House of David who took Our Lady as his chaste spouse to fulfill God’s holy will. Saint Joseph voluntarily renounced his own biological fatherhood so as to safeguard Our Lady’s perpetual virginity. He denied himself the joy of his own offspring so as to devote himself entirely to his foster-Child, Our Blessed Lord and Savior Jesus Christ. A man who lived his entire life in poverty enriched Our Blessed Lord and Saviour Jesus Christ and Our Lady by the love he gave them from his pure heart, a heart that was itself enriched by being in the presence of the Immaculate Heart of Mary and the Sacred Heart of Jesus. Saint Joseph is the model for all husbands and fathers. He should be especially dear to men who are foster-fathers themselves, men who have voluntarily taken unto their own care children whom they did not beget. But dear Saint Joseph is the model for all husbands and fathers everywhere. He was obeyed as the head of that family by Our Blessed Lord and Saviour Jesus Christ, the Word made Flesh Himself, and Our Lady. Indeed, what a consummate sign of humility Our Blessed Lord and Saviour Jesus Christ gave us simply by condescending to live in the midst of the Holy Family, subjecting Himself to the authority of His own creatures. Saint Joseph, the Patron of the Universal Church, was first the visible head of the Holy Family of Nazareth. Saint Joseph was asked in a dream by Saint Gabriel the Archangel to have no fear to take Mary as his wife, that the Child she was carrying had been conceived by the power of the Third Person of the Blessed Trinity, God the Holy Ghost. He did Saint Gabriel had instructed him. He was the first man, therefore, to be directly affected by the Annunciation of Our Lord to Our Lady. The Word was made Flesh at the Annunciation–and very soon thereafter was entrusted to Saint Joseph’s care. Even though he was not in the garden when Saint Gabriel appeared to the Blessed Mother, he was to be apprised of what took place there rather swiftly after it took place. Saint Joseph led the family that had been entrusted to his good care on the seventy mile journey from Nazareth to Bethlehem. It was Saint Joseph who found the place for His foster-Son to be born, surrounding Him with every care and affection, adoring Him as his God and Redeemer at the moment of His birth. He was present as the aged Simeon prophesied that a sword of sorrow would pierce his most chaste spouse’s Immaculate Heart. Do not think for a moment that his own heart was not wounded by this prophecy. It was. There was a union of the three hearts in the Holy Family, which is why we pray, “Jesus, Mary, and Joseph, we love you. Save souls. Jesus, Mary, and Joseph, pray for us now and in death’s agony.” The sorrows of Our Lady were the sorrows of Saint Joseph. Saint Joseph responded promptly to the call of Saint Gabriel the Archangel, received in a dream, to take his virginal spouse and his foster-Son to Egypt to flee from the wicked schemes of Herod the Great. Saint Joseph had to make a living in a foreign land, waiting to be called out of Egypt so that his foster-Son, the new Moses, could retrace the steps of the one to whom He had entrusted the first Passover, which was to be superseded by the New and Eternal Passover for which He had came into the world to ratify with every single drop of His Most Precious Blood. Imagine the daily joy and peace and serenity that surrounded the Holy Family. Saint Joseph and Our Lady were always in the Presence of God Himself. Although there are various private revelations about the nature of the Holy Family’s life, Sacred Scripture is as silent about the events of the Hidden Years in Nazareth as Saint Joseph himself. There is a reason for this silence: Our Blessed Lord and Saviour Jesus Christ was teaching us that each of us will grow up in a family. Those of us who get married and are blessed with children are to replicate in our own lives the joy and peace and serenity of the Holy Family of Nazareth day in and day out, fulfilling the duties of our state-in-life without complaint and without delay. 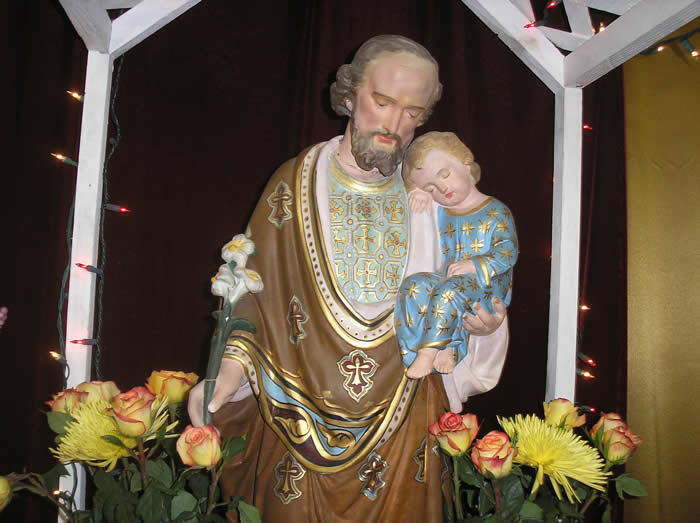 Husbands and fathers must see in Saint Joseph the perfect model of what it is to be the head of one’s household, intent on developing the manly Catholic virtues of patience and charity and courage and perseverance exhibited to their highest degree in the person of Saint Joseph. Saint Joseph suffered along with Our Lady when the Child Jesus stayed behind in Jerusalem to answer questions being posed to him by the doctors of the law. The fright in his heart was palpable when he discovered that his foster-Son was not in their company. His relief was visible when his foster-Son was found. His acceptance of God’s will about this event was total. Not a word of complaint. He knew that his foster-Son had to be about His Heavenly Father’s business once he heard this from the mouth of the One to Whom he gave love, clothing, shelter and instruction. How fitting it is that Saint Joseph, who was the head of the Holy Family of Nazareth, is the Patron of the Universal Church. We need to invoke his intercession more faithfully for the needs of Holy Mother Church. For just as Saint Joseph protected the Infant Jesus and Our Lady during their flight to Egypt, so, too, has Our Blessed Lord and Saviour Jesus Christ entrusted to His foster-father the protection of His Mystical Body, the Church, here on earth. So too does he watch over our priests, who called to imitate his virtue of chastity by denying themselves their biological fatherhood in order to be the spiritual father of others. Saint Joseph is very close to priests and wants them to keep their purity unstained by anything. He wants them to be lovers of Holy Poverty after his own holy heart. And he wants them to be steadfast in maintaining the Tradition that his foster-Son’s Apostles have handed down to them under the protection of the Holy Ghost. Glorious and happy as was the death of St. Joseph, the gates of Heaven remained closed to him. Angels conducted his soul to Limbo, where a multitude of just and holy spirits of the Old Law were patiently awaiting the arrival of their Redeemer after the completion of His work on Golgotha’s hill. Faith teaches that the reward promised by God to those who serve Him faithfully is in proportion to the merits they acquired upon earth. No one will imagine a grander, more sublime or meritorious position than that filled by St. Joseph. He cast protecting arms around Jesus, the God-Man, and his spouse, the Blessed Virgin Mary–the loveliest and holiest of creatures–when the life of the Child was endangered by the wicked King Herod and his soldiers. Thus he cooperated in the sublime work of our salvation. He endured sacrifices and privations of every kind. Many were the days of hard toil endured to provide for the needs of the Holy Family. As a carpenter St. Joseph glorified labor, since he was ever united with God and offered all in humble obedience to His Will. Silently and humbly, patiently and lovingly he went about his daily tasks, never complaining; though his life could easily have been a monotonous and difficult one in the small workshop at Nazareth. As the foster-father of Jesus, it was his duty to teach the Child Jesus. In the revelations of St. Bridget we have the Blessed Virgin saying: “My Son was so obedient that when Joseph said, ‘Do this or do that’, immediately He did it”. “My daughter, although you have written that my spouse Joseph was one of the greatest saints and most noble princes of the celestial Jerusalem, you cannot now declare his eminent sanctity. Mortals can never know it until they enjoy the vision of God, in which they will with admiration discover the mystery, and they will praise the Lord for it. In the last day when all men will be judged, the unhappy damned will weep bitterly for not having known, because of their sins, this powerful and efficacious means for their salvation, and for not having availed themselves of it, as they could have done, to recover the grace of the just Judge. The world has been greatly ignorant of the magnitude of the prerogatives which the supreme Lord has accorded to my holy spouse, and how powerful is his intercession with His Divine Majesty; for be assured that he is one of the greatest favorites of God, and one of the most capable of appeasing His justice against sinners. I desire you to be most grateful to the goodness of the Lord for the favor which I have granted to you on this occasion, and that you will render Him continual thanks for the illumination that you have received touching this mystery. Endeavor also, in the future, to augment your devotion for my holy spouse, and bless the Lord for that He has favored him with so much liberality, and also for the consolation that I enjoyed in bearing him company and knowing his perfections. “You must avail yourself of his intercession in all your necessities and so act as to multiply the numbers of his votaries. Recommend to your daughters to distinguish themselves in this devotion, since the Most High grants on earth that which my spouse requests in Heaven, and He will unite to these requests extraordinary favors for men, provided they do not render themselves unworthy to receive them. Imagine what our ecclesiastical situation would look like if Catholics prayed to Saint Joseph for the restoration of the true Faith and the vanquishing once and for all of the counterfeit church of conciliarism and all of its novelties, including the Protestant and Masonic Novus Ordo service. Imagine what the world would look like if Catholics invoked the intercession of the just man, Saint Joseph, to restore the Social Reign of His Divine foster-Son and of His Virginal Spouse, Mary Immaculate, banishing forever the falsehoods of Modernity and Modernism. Imagine what each one of our lives would be like if we asked him for the graces to imitate his love and his joy for serving Our Blessed Lord and Saviour Jesus Christ and Our Lady in humility and with patient endurance of trials and sufferings. 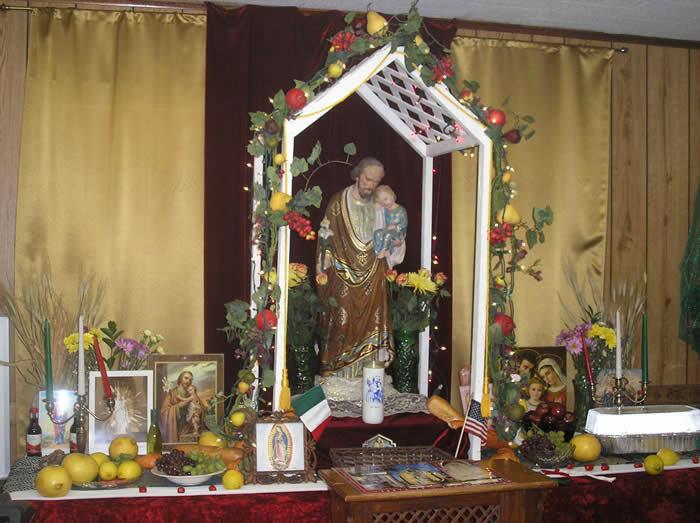 Saint Joseph has appeared with his virginal spouse in Knock, Ireland, and in Fatima, Portugal. Jacinta and Francisco Marto and Lucia dos Santos saw Saint Joseph bless the crowd three times as the Miracle of the Sun took place on October 13, 1917. Our Blessed Lord and Saviour Jesus Christ has seen to it that his foster-father, the just and quiet man of the House of David, is honored by us for the role he played in our redemption and the role he plays in helping us to get to Heaven. Along with all of the other angels and saints, including Our Lady, Saint Joseph is present at every Mass. We praise and glorify thee, O happy saint! We hail thee as the spouse of the Queen of heaven, and foster-father of our Redeemer. These titles, which would seem too grand for any human being to enjoy, are thine; and they are but the expression of the dignities conferred on thee by God. The Church of heaven admires the sublime favours thou hast received; the Church on earth joyfully celebrates thy glories, and blesses thee for the favours thou art so unceasingly bestowing upon her. Though born of the kingly race of David, thou was the humblest of men; thy spirit led thee to seek obscurity, and a hidden life was thine ambition: but God chose thee to be an instrument in the sublimest of all His works. A noble Virgin of the same family of David, the object of heaven’s admiration, and the glory and hope of the world, is to be thy bride. The Holy Ghost is to dwell within her as in a most pure tabernacle; it is to thee, the just and chaste, that He entrusts her as an inestimable treasure. Espouse, then, to thyself her whose beauty the King of heaven so greatly desires. The Son of God comes down to this earth, that He may live the life of man; He comes that He may sanctify the ties and affections of kindred. He calls thee father; He obeys thy orders. What strange emotions must have filled thy heart, O Joseph! when, knowing the prerogatives of thy bride and the divinity of they adopted Son, thou hadst to be the head of this family, which united heaven and earth into one! What respectful and tender love for Mary, thy blessed bride! What gratitude and profound worship of Jesus, Who obeyed thee as they Child! Oh mysteries of Nazareth! a God dwells among men, and permits Himself to be called the Son of Joseph! O sublime minister of the greatest of blessings, intercede for us with God made Man. Ask Him to bestow humility upon us, that holy virtue which raised thee to such exalted dignity, and which must be the basis of our conversation. It is pride that led us into sin, and made us prefer our own will to that of God: yet will He pardon us if we offer Him the sacrifice of a contrite and humble heart. Get us this virtue, without which there can be no true penance. Pray also for us, O Joseph, that we may be chaste. Without purity of mind and body we cannot come nigh the God of all sanctity, who suffers nothing defiled to approach Him. He wills to make our bodies, by His grace, the temples of His holy Spirit: do thou, great saint, help us to maintain ourselves in so exalted a dignity, or to recover it if we have lost it. The special motives for which St. Joseph has been proclaimed Patron of the Church, and from which the Church looks for singular benefit from his patronage and protection, are that Joseph was the spouse of Mary and that he was reputed the Father of Jesus Christ. From these sources have sprung his dignity, his holiness, his glory. In truth, the dignity of the Mother of God is so lofty that naught created can rank above it. But as Joseph has been united to the Blessed Virgin by the ties of marriage, it may not be doubted that he approached nearer than any to the eminent dignity by which the Mother of God surpasses so nobly all created natures. For marriage is the most intimate of all unions which from its essence imparts a community of gifts between those that by it are joined together. Thus in giving Joseph the Blessed Virgin as spouse, God appointed him to be not only her life’s companion, the witness of her maidenhood, the protector of her honor, but also, by virtue of the conjugal tie, a participator in her sublime dignity. And Joseph shines among all mankind by the most august dignity, since by divine will, he was the guardian of the Son of God and reputed as His father among men. Hence it came about that the Word of God was humbly subject to Joseph, that He obeyed him, and that He rendered to him all those offices that children are bound to render to their parents. From this two-fold dignity flowed the obligation which nature lays upon the head of families, so that Joseph became the guardian, the administrator, and the legal defender of the divine house whose chief he was. And during the whole course of his life he fulfilled those charges and those duties. He set himself to protect with a mighty love and a daily solicitude his spouse and the Divine Infant; regularly by his work he earned what was necessary for the one and the other for nourishment and clothing; he guarded from death the Child threatened by a monarch’s jealousy, and found for Him a refuge; in the miseries of the journey and in the bitternesses of exile he was ever the companion, the assistance, and the upholder of the Virgin and of Jesus. Now the divine house which Joseph ruled with the authority of a father, contained within its limits the scarce-born Church. From the same fact that the most holy Virgin is the mother of Jesus Christ is she the mother of all Christians whom she bore on Mount Calvary amid the supreme throes of the Redemption; Jesus Christ is, in a manner, the firstborn of Christians, who by the adoption and Redemption are his brothers. And for such reasons the Blessed Patriarch looks upon the multitude of Christians who make up the Church as confided specially to his trust — this limitless family spread over the earth, over which, because he is the spouse of Mary and the Father of Jesus Christ he holds, as it were, a paternal authority. It is, then, natural and worthy that as the Blessed Joseph ministered to all the needs of the family at Nazareth and girt it about with his protection, he should now cover with the cloak of his heavenly patronage and defend the Church of Jesus Christ. You well understand, Venerable Brethren that these considerations are confirmed by the opinion held by a large number of the Fathers, to which the sacred liturgy gives its sanction, that the Joseph of ancient times, son of the patriarch Jacob, was the type of St. Joseph, and the former by his glory prefigured the greatness of the future guardian of the Holy Family. And in truth, beyond the fact that the same name—a point the significance of which has never been denied—was given to each, you well know the points of likeness that exist between them; namely, that the first Joseph won the favor and especial goodwill of his master, and that through Joseph’s administration his household came to prosperity and wealth; that (still more important) he presided over the kingdom with great power, and, in a time when the harvests failed, he provided for all the needs of the Egyptians with so much wisdom that the King decreed to him the title “Savior of the world.” Thus it is that We may prefigure the new in the old patriarch. And as the first caused the prosperity of his master’s domestic interests and at the same time rendered great services to the whole kingdom, so the second, destined to be the guardian of the Christian religion, should be regarded as the protector and defender of the Church, which is truly the house of the Lord and the kingdom of God on earth. These are the reasons why men of every rank and country should fly to the trust and guard of the blessed Joseph. Fathers of families find in Joseph the best personification of paternal solicitude and vigilance; spouses a perfect example of love, of peace, and of conjugal fidelity; virgins at the same time find in him the model and protector of virginal integrity. The noble of birth will earn of Joseph how to guard their dignity even in misfortune; the rich will understand, by his lessons, what are the goods most to be desired and won at the price of their labor. As to workmen, artisans, and persons of lesser degree, their recourse to Joseph is a special right, and his example is for their particular imitation. For Joseph, of royal blood, united by marriage to the greatest and holiest of women, reputed the father of the Son of God, passed his life in labor, and won by the toil of the artisan the needful support of his family. It is, then, true that the condition of the lowly has nothing shameful in it, and the work of the laborer is not only not dishonoring, but can, if virtue be joined to it, be singularly ennobled. Joseph, content with his slight possessions, bore the trials consequent on a fortune so slender, with greatness of soul, in imitation of his Son, who having put on the form of a slave, being the Lord of life, subjected himself of his own free-will to the spoliation and loss of everything. What and what manner of man the blessed Joseph was, we may gather from that title wherewith, albeit only as a deputy, God deemed him fit to be honoured he was both called, and supposed to be the Father of God. We may gather it from his very name, which, being interpreted, signifieth Increase. Remember likewise that great Patriarch who was sold into Egypt, and know that the Husband of Mary not only received his name, but inherited his purity, and was likened to him in innocence and grace. If then, that Joseph that was sold by his brethren through envy, and was brought down to Egypt, was a type of Christ sold by a disciple, and handed over to the Gentiles, the other Joseph flying from the envy of Herod carried Christ into Egypt. That first Joseph kept loyal to his master, and would not carnally know his master's wife; that second Joseph knew that the Lady, the Mother of his Lord, was a virgin, and he himself remained faithfully virgin toward her. To that first Joseph it was given to know dark things in interpreting of dreams; to the second Joseph it was given in sleep to know the mysteries of the kingdom of heaven. To-day, Joseph, the spouse of Mary, the foster-father of the Son of God, comes to cheer us by his dear presence. In a few days hence the august mystery of the Incarnation will demand our fervent adoration: who could better prepare us for the grand feast, than he that was both the confidant and the faithful guardian of the divine secret? The Son of God, when about about to descend upon this earth to assume our human nature, would have a Mother; this Mother could not be other than the purest of Virgins, and her divine maternity was not to impair her incomparable virginity. Until such time as the Son of Mary were recognized as the Son of God, His Mother’s honour had need of a protector; some man, therefore, was to be called to high dignity of being Mary’s spouse. This privileged mortal was Joseph, the most chaste of men. Heaven designated him as being the only one worthy of such a treasure: the rod he held in his hand in the temple suddenly produced a flower, as though it were a literal fulfillment of the prophecy of Isaias: ‘There some come forth a rod from the root of Jesse, and a flower shall rise up out his root.’ The rich pretenders to an alliance with Mary were set aside; and Joseph was espoused to the Virgin of the house of David, by a union which surpassed in love and purity everything the angels themselves had ever witnessed. But he was not only chosen to the glory of having to protect the Mother of the Incarnate Word; he was also called to exercise adoptive paternity over the very Son of God. So long as the mysterious cloud was over the Saint of saints, men called Jesus the Son of Joseph and the carpenter’s Son. When our blessed Lady found the Child Jesus in the temple, in the midst of the doctors, she thus addressed him: ‘Thy father and I have sought Thee sorrowing’; and the holy evangelist adds that Jesus was subject to them, that is, that He was subject to Joseph as He was to Mary. Who can imagine or worthily describe the sentiments which filled the heart of this man, whom the Gospel describes to us in one word, when it calls him the just man? Let us try to picture him to ourselves amidst the principal events of his life: his being chosen as the spouse of Mary, the most holy and perfect of God’s creatures: the angel’s appearing to him, and making him the one single human confidant of the mystery of the Incarnation, by telling him that his Virgin bride bore within her the fruit of the world’s salvation: the joys of Bethlehem, when he assisted at the birth of the divine Babe, honoured the Virgin Mary, and heard the angels singing; his seeing first the humble and simple shepherds, and then the rich eastern magi, coming to the stable to adore the new-born Child; the sudden fears which came to him, when he was told arise, and, midnight, as it was, to flee into Egypt with the Child and the Mother; the hardships of that exile, the poverty and privations which were endured by the hidden God, whose father-father he was, and by the Virgin, whose sublime dignity was now so evident to him; the return to Nazareth, and the humble, laborious life led in that village, where he so often witnessed the world’s Creator sharing in the work of a carpenter; the happiness of such a life, in that cottage where his companions were the Queen of the angels and the eternal Son of God, both of whom honoured, and tenderly loved him as the head of the family—yes, Joseph was beloved and honoured by the uncreated Word, the Wisdom of the Father, and by the Virgin, the masterpiece of God’s power and holiness. Such a life could not close save by a death that was worthy of so great a saint. The time came for Jesus to quit the obscurity of Nazareth, and show Himself to the world. His own works were henceforth to ear testimony to His divine origin; the ministry of Joseph, therefore, was no longer needed. It was time for him to leave this world, and await, in Abraham’s bosom, the arrival of that day, when heaven’s gates were to be opened to the just. As Joseph lay on his bed of death, there was watching by his side He that is the master of life, and that had often called this His humble creature, father. His last breath was received by the glorious Virgin-Mother, whom he had, by a just right, called his bride. It was thus, with Jesus and Mary by his side, caring for and caressing him, that Joseph sweetly slept in peace. The spouse of Mary, the foster-father of Jesus, now reigns in heaven with a glory which, though inferior to that of Mary, is marked with certain prerogatives which no other inhabitant of heaven can have. 175. The most happy of men, St. Joseph, reached an age of sixty years and a few days, for at the age of thirty-three he espoused most holy Mary and lived in her company until just past sixty years of age. When the holy spouse St. Joseph died She had reached an age of forty-one years and nearly half of her forty-second year, for She was espoused to St. Joseph at the age of fourteen (as stated in the Part I, Book Two, chapter XXII). The twenty-seven years of her married life completed her forty-first year, to which must be added the time from the eighth of September until the death of her most holy spouse. The Queen of heaven still remained in the same disposition of natural perfection as in her thirty-third year, for as already stated in chapter XIII of this Book (145) She showed no signs of decline, or more advanced age, or weakness, but always remained in that same most perfect state of womanhood. She felt the natural sorrow due to the death of St. Joseph, for She loved him as her spouse, as a Saint so excellent in perfection, and as her protector and benefactor. This sorrow in the most prudent Lady was well ordered and most perfect, but it was far from being therefore less deep, for her love was great, yea so much the greater as She was well informed of the high rank he held among the saints who are written in the book of life and in the mind of the Most High; and if we do not lose without sorrow what we love in an ordinary manner, so much the greater will be our sorrow for losing what we love much. 176. It is not the purpose of this History to describe at length the perfections and excellences of St. Joseph, nor have I any commission to do so except insofar as shall suffice to point out his dignity and that of our Queen, to whose merits (after those of her divine Son) must be ascribed the gifts and graces conferred by the Almighty upon this glorious Patriarch. The heavenly Lady was either the instrumental or meritorious cause of the sanctity of her spouse, or at least the final object or purpose of this sanctity, for all the fullness of virtues and grace was conferred upon St. Joseph for the purpose of making him her worthy protector and spouse, She whom God selected as his Mother. According to this standard and according to the love of God for his most holy Mother is to be measured the sanctity of St. Joseph, and from my understanding of this matter if there had been in the world another man more perfect and more worthy the Lord would have chosen this other one for the spouse of his Mother. Since he was chosen by God, St. Joseph was no doubt the most perfect man upon earth. Having created and destined him for such high ends, it is certain God in his almighty power prepared and perfected him in proportion to the loftiness of those ends; and this proportion (according to our way of understanding) had to be established by the divine light by the sanctity, virtues, gifts, graces, and infused and natural inclinations of St. Joseph. 177. I perceive a certain difference in the graces given to this great Patriarch and those vouchsafed to other saints, for many saints were endowed with graces and gifts which were intended not for the increase of their own sanctity but for the advance of the service of the Most High in other souls; they were, so to say, gifts and graces freely given and not dependent upon the sanctity of the receiver. But in our blessed Patriarch all the gifts added to his virtues and sanctity, for the effect toward which they were destined and directed was the mystery of his sanctity and works. The more angelic and holy he grew to be, so much the more worthy was he to be the spouse of most holy Mary and the depository and treasure house of heavenly sacraments. He was to be a miracle of sanctity, as he really was. This marvelous holiness began with the formation of his body in the womb of his mother, since in her the particular providence of God assisted, regulating the composition of the four humors of his body with extreme refinement of proportion and securing for him that evenly tempered disposition which made his body a blessed earth fit for the abode of an exquisite soul and well-balanced mind (Wis. 8:19). He was sanctified in the womb of his mother seven months after his conception, and the fomes peccati* was destroyed in him for the whole course of his life; thus he never felt any impure or disorderly movement. Although he did not receive the use of his reason together with this first sanctification, which consisted principally in justification from original sin, yet his mother at the time felt a wonderful joy of the Holy Ghost. Without understanding entirely the mystery she elicited great acts of virtue and believed her son, or whomever she bore in her womb, would be wonderful in the sight of God and men. 178. The holy child Joseph was born most beautiful and perfect in body, and caused in his parents and in his relations an extraordinary delight, something like that caused by the birth of St. John the Baptist, though the cause of it was more hidden. The Lord hastened in him the use of his reason, perfecting it in his third year, endowing it with infused science and augmenting his soul with new graces and virtues. From that time the child began to know God by faith, and also by natural reasoning and science, as the cause and Author of all things. He eagerly listened to and understood profoundly all that was taught to him regarding God and his works. At this premature age he already practiced the highest kinds of prayer and contemplation, and eagerly engaged in the exercise of the virtues proper to his youth, and thus at the time when others come to the use of reason, at the age of seven years or more, St. Joseph was already a perfect man in the use of it and in sanctity. He was of a kind disposition, loving, affable, sincere, showing inclinations not only holy but angelic, growing in virtue and perfection, and advancing toward his espousal with most holy Mary by an altogether irreproachable life. 179. For the confirmation and increase of his good qualities was then added the intercession of the heavenly Lady, for as soon as She was informed the Lord desired Her to enter the married state with him She earnestly besought the Lord to sanctify St. Joseph and inspire him with most chaste thoughts and desires in conformity with her own. The Lord listened to her prayer and permitted Her to see what great effects his right hand wrought in the mind and spirit of the patriarch St. Joseph. They were so copious that they cannot be described in human words. He infused into his soul the most perfect habits of all the virtues and gifts; He balanced anew all his faculties and filled him with grace, confirming him in it in an admirable manner. In the virtue and perfection of chastity the holy spouse was elevated higher than the Seraphim, for the purity which they possessed without body St. Joseph possessed in his earthly body and in mortal flesh. Never did an image of the impurities of the animal and sensible nature engage even for one moment any of his faculties. This freedom from all such imaginations and his angelic simplicity fitted him for the companionship and presence of the most pure among all creatures, and without this excellence he would not have been worthy of such a great dignity and rare excellence. 180. Also in the other virtues he was wonderfully distinguished, especially in charity, for he dwelt at the fountainhead of that living water which flows on to eternal life (Jn. 4:14); he was in close proximity to that sphere of fire and was consumed without resistance. The best that can be said of the charity of our loving Saint is what I have already said in the preceding chapter, namely that his love of God was really the cause of his mortal sickness and death. The manner of his death was a privilege of his singular love, for his sweet sighs of love surpassed and finally put an end to those of his sickness, being far more powerful. As the objects of his love, Christ our Lord and his Mother, were present with him always, and as both of them were more closely bound to him than to any other mortal, his most pure and faithful heart was unavoidably consumed by the loving effects of such a close union. Blessed be the Author of such great wonders, and blessed be Joseph, the most happy of mortals, who was worthy of all that was wrought in him. He deserves to be known and extolled by all the generations of men and all nations, since the Lord has wrought such things with no other man, and to none has He shown such love. 181. The divine visions and revelations vouchsafed to St. Joseph I have particularly mentioned in the course of this History (Inc. 422, 472; Tran. 164), but there were many more than can be described, and the greatest of them all was his having known the mysteries of the relation between Christ and his Mother, and his having lived in their company for so many years as the putative father of the Lord and as the true spouse of the Queen of heaven. But I have been given to understand certain other privileges which because of his great sanctity were conceded to St. Joseph by the Most High for those who would ask his intercession in a worthy manner. The first is for attaining the virtue of purity and for overcoming the sensual inclinations of the flesh; the second, for procuring powerful help to escape sin and return to the friendship of God; the third, for increasing the love and devotion to most holy Mary; the fourth, for securing the grace of a happy death and protection against the demons in that hour; the fifth, for inspiring the demons with terror at the mere mention of his name by his clients; the sixth, for gaining health of body and assistance in all kinds of difficulties; the seventh, for securing issue of children in families. These and many other favors God confers upon those who properly and with good disposition seek the intercession of St. Joseph, the spouse of our Queen. I beseech all the faithful children of the Church to be very devout to him, and they shall experience these favors in reality if they dispose themselves as they should in order to receive and merit them. 182. My daughter, although thou hast described my spouse St. Joseph as the most noble among the princes and saints of the heavenly Jerusalem, yet neither canst thou properly manifest his eminent sanctity, nor can any of the mortals know it fully before they arrive at the vision of the Divinity. Then all of them shall be filled with wonder and praise, since the Lord shall make them capable of understanding this sacrament. On the Last Day, when all men shall be judged, the damned shall bitterly bewail their sins which prevented them from appreciating this powerful means of their salvation, and for failing to avail themselves, as they easily could have, of this intercessor to gain the friendship of the just Judge. The whole human race has much undervalued the privileges and prerogatives conceded to my blessed spouse, and they know not what his intercession with God is able to do. I assure thee, my dearest, that in the presence of the divine justice he is one of the greatly favored personages, and has immense power to stay the arms of divine vengeance against sinners. Saint Joseph is our helper in time of need. After Our Lady herself, we should call upon Saint Joseph to help us at every turn as we endeavor to fulfill our daily duties and as we seek to labor hard at saving our souls as members of the Catholic Church, which is blessed to have him as her Universal Patron. We can have every confidence in the prayers and petitions we offer to our Protector and our friend, the lover of Holy Poverty and the Patron of a Happy, Holy Death, Saint Joseph of Nazareth. Good Saint Joseph, just man of the House of David, pray for us to imitate your virtues. Pray for us to persevere in the graces won for us by the shedding of your foster-Child’s Most Precious Blood on the wood of the Holy Cross and that flow into our hearts and souls through the loving hands of thy Virginal Spouse, the Mediatrix of All Graces. Pray for us to be meek and humble of heart, consecrated as we must be to the Sacred Heart of Jesus through the Immaculate Heart of Mary. Jesus, Mary, and Joseph, we love you, save souls. Our Lady, ever virginal spouse of Saint Joseph, pray for us. O Saint Joseph, whose protection is so great, so strong, so prompt before the throne of God, I place in thee all my interests and desires. O thou Saint Joseph, do assist me by thy powerful intercession, and obtain for me from thy divine Son all spiritual blessings, through Jesus Christ, Our Blessed Lord and Saviour Jesus Christ; so that, having engaged here below thy heavenly power, I may offer my thanksgiving and homage to the most loving of fathers. O Saint Joseph, I never weary contemplating thee, and Jesus asleep in thy arms; I dare not approach while He reposes near thy heart. Press Him in my name and kiss His fine head for me, and ask Him to return the kiss when I draw my dying breath. Saint Joseph, Patron of departing souls, pray for me. Amen!